120 people from around Australia attended 25th August’s Forum on the National Disability Insurance Scheme (NDIS) for people with a brain injury, held in partnership with the University of Sydney’s Centre for Disability Research and Policy. 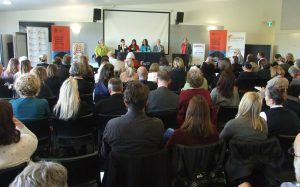 Speakers included Dr. Hans Reinders, Professor of Ethics and Mental Disability from the Free University of Amsterdam, Associate Professor Natasha Lannin from La Trobe University, and the Deputy CEO of the National Disability Insurance Agency, Ian Maynard. The Forum explored opportunities for maximising the social and economic participation of people with a brain injury by building effective relationships with mainstream services including health, housing and employment. It also investigated best practice goal-setting and planning for people with a brain injury. Professor Gwynnyth Llewellyn, Director of the Centre for Disability Research and Policy from the University of Sydney, led a panel discussion bringing together key players in the Scheme’s “trial sites” with those driving its nationwide roll out – including Mary Hawkins, Director of Engagement for New South Wales Central for the National Disability Insurance Agency and Kerry Stafford, the Executive Director of Acquired Brain Injury Services NSW. The Forum’s program is available here. Video, as well as a report from the Forum, will be available shortly.